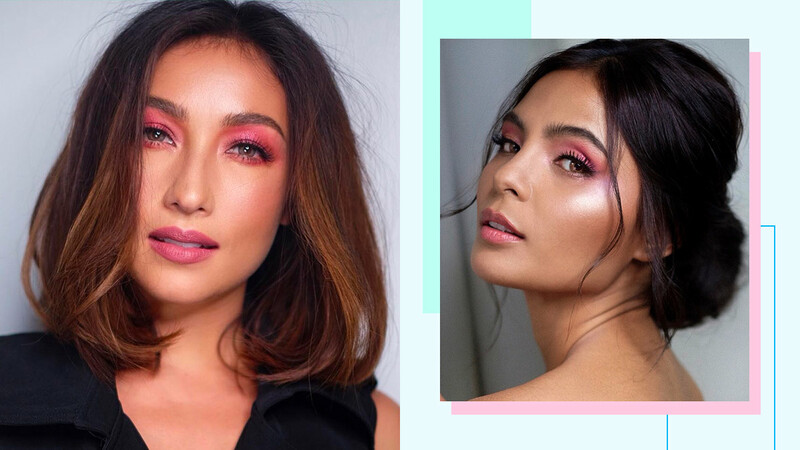 And in case you're intimidated to wear it, we spoke to two celebrity makeup artists—Robbie Pinera and Anthea Bueno—to get the best tips for how to make pink work for you. In a message exchange, Robbie advises you "try out the most subtle pink first" and "mix it with your favorite browns or taupes, or just simply add it on top to your usual/favorite eyeshadow. You will notice it will instantly brighten up your eyes." Furthermore, Anthea recommends you should "know what works with your skin tone," and states that "warmer shades of pink compliments tan/morena skin while cooler tones work well with fairer skin." Noted! For inspo on how to wear the romantic hue, check out these motds! This kind of pink offers a *hint* of color, giving it an ethereal look. Wearing a color this bold and bright will definitely catch everyone's eye and earn you compliments! A light wash of peachy pink on your lids, cheeks, and lips makes it a perfect everyday makeup look! Remember the pink crayon you used to have as a kid? Well, the hue looks amazing on all skin tones!